After a lovely quiet and relaxing break I will be opening the store tomorrow and our normal shop hours resume.This is the first time in 15 years that I have taken the full holiday and I must admit it has been wonderful. As many of you know, I am not one for partying and socializing, I much prefer time spent with my immediate family and activities such as pottering in my cottage garden, taking my Labrador for long walks, or catching up with a good book (normally a book on gardening, dogs or cooking) are my idea of Heaven. It was an exceptionally quiet Christmas however, as my eldest daughter, Francesca, flew off on December 22nd for her new life/adventure/career and all things amazing in Melbourne. Although I would not want it any other way, there were tears on Christmas morning as her absence was acutely felt. Although the shop has been closed I have actually been productively working. 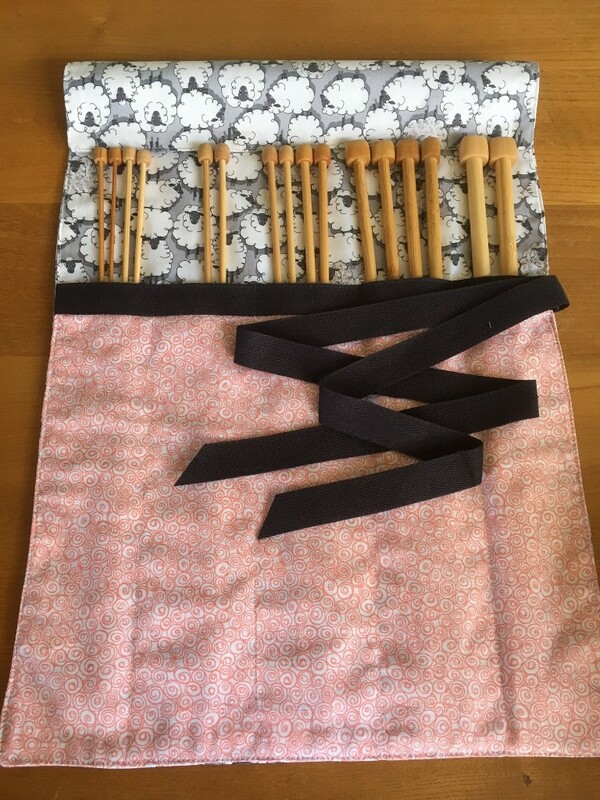 For many years I have wanted to produce my own range of knitting needle rolls and knitting bags for the shop, but a lack of time, knowledge and a good sewing machine have prevented this dream coming to fruition. For years I have secretly stashed and hoarded beautiful fabric, I just liked looking at it, much like an object of art. I know for a fact that many of my lovely customers do much the same thing with wool, and just like me, family members are not always aware of the extent/cost of this secretive, but incredibly pleasurable habit. The 'time' factor was easy...I just closed the shop for 10 days.I had let you all know in advance and judging by the fast and furious sales in the lead up to Christmas, you all had far more wool than could possibly be required, even if rain were forecast for the whole holiday period. 'Knowledge' was my second hurdle. In my dreams I can make curtains, dresses and do all manner of repairs and alterations. 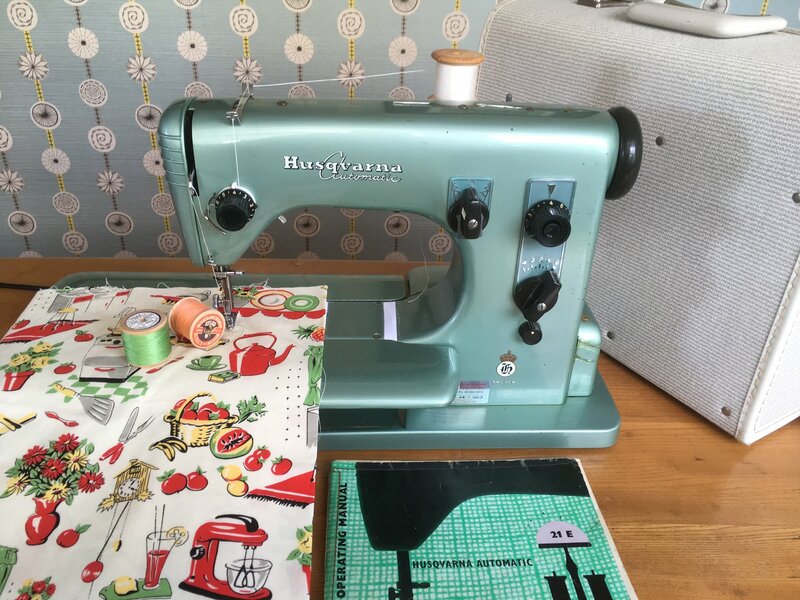 Some years ago I bought a pattern for a wrap dress and dusted off my extremely basic and unreliable Brother sewing machine. I purchased some fabric, I liked the colour and print but it was totally unsuitable for my project. I laid out the pattern pieces, took my measurements, and started cutting out pattern pieces. I now know how daunting reading a knitting pattern and choosing the correct wool and needles must be for a novice knitter, although I prefer to blame my pattern, my sewing machine and my tape measure! I 'made it up' as I went along and needless to say the end result was a disaster. My family howled with laughter, the dress got stuffed in the bin, and the sewing machine donated to a charity shop. I had expected to produce a whole pile of knitting bags and needle rolls by the new year, but I suppose there's a reason why Annie's degree is four years. I naively expected it was just a case of measure, cut and sew...stupid me. I have managed to produce 7 needle rolls and just one prototype knitting bag. I have spent many hours using a 'quick unpick', I know my tape measure is accurate, my scissors are true, and my machine is excellent. Unfortunately it will take many hours for me to become proficient, and thankfully for you, I will not be pricing my needle rolls to reflect the hours of work that went into them! So, please do call into the shop, take a look at my handiwork, and please pass any sewing tips on to me. They will be gratefully received, although helpful hints on using a 'quick unpick will not be necessary! Well it's time to take Harry, my Labrador for a swimming lesson at Takapuna Beach. He is an anxious fellow but enticed by copious amounts of Christmas ham, he has managed to take his feet off the bottom and manage a few hilarious and frenzied strokes of dogie paddle.